← Wordless Wednesday: 7₵ Snack! 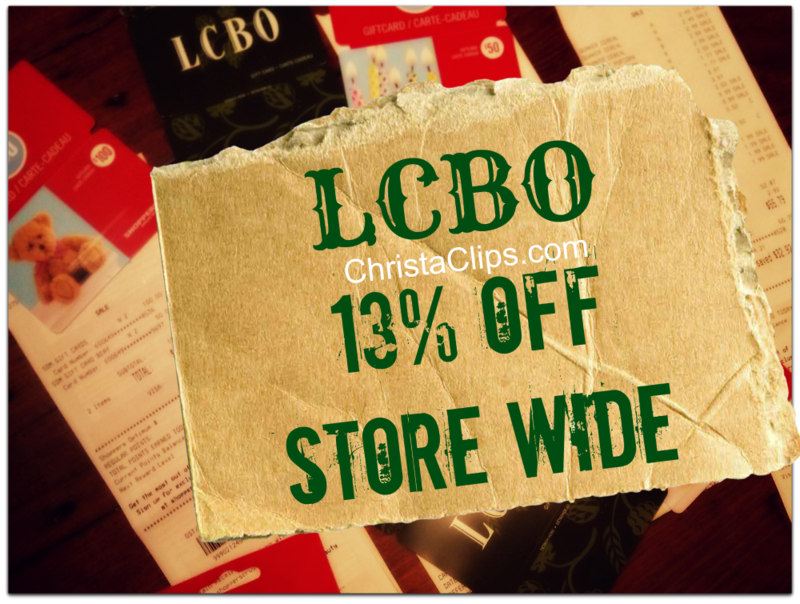 Learn about Christa Clips’ latest budget hack: how to SAVE 13% on everything at the LCBO this holiday season! Have you ever seen a 13% OFF store-wide sale at the LCBO? Me neither (for the non-local-yocals, the Liquor Control Board of Ontario is where we buy our hooch here in Ontario, Canada! Oh wait, that still sounds very yocal, doesn’t it!). How about “We’ll cover the Tax on your Wine?”. There’s a sign we’ll never see! Even though there really are never store-wide sales at the LCBO, or coupons, or perks other than Air Miles, there IS a way to make your own sale at the LCBO by purchasing gift cards this week at Shoppers Drug Mart. And if you’re looking for ways of savings on your holiday entertaining – this is an easy way to start! The Promotion: Purchase $150 in gift cards (divided between at least 2 cards in the Gift Card Mall) at Shoppers Drug Mart until November 15, 2013 and earn 8,000 Shoppers Optimum Points. 8,000 points on their own are worth $10 in FREE stuff anytime at Shoppers Drug Mart. I always bank my Optimum points, though, and redeem them only when I reach the optimum 95,000 Points at a Spend Your Points Event where they are worth a lot more. These 8,000 Optimum points are worth at least $19.20 in FREE stuff to me – more if I redeem manufacturer’s coupons at the same time. I’ve been known to do that (; The 8,000 Bonus Points will be credited to our Optimum accounts by the end of the day on November 22, 2013. Each Optimum account holder can earn up to 3 of these 8,000 offers. I also purchased $300 in Shoppers Drug Mart gift cards and made out even better because Shoppers cards are the only gift cards in the entire Gift Card Mall that are “pointable”. That means I earned 3,000 regular Optimum Points at the time that I purchased those cards, plus an extra 16,000 Bonus Points for a total of 19,000 points worth $45.60 in FREE stuff. We buy all of our milk, bread, and eggs at Shoppers Drug Mart and you can also use their gift cards to pay for your prescriptions. In essence, I’m “pre-paying” for our groceries, prescriptions, and personal products that we buy at Shoppers Drug Mart and starting with a base of 15% OFF. Throw in some sale prices, manufacturer’s coupons and another Shoppers Drug Mart store perks (e.g. 20x Points, 20% OFF coupons, etc) and I’ll be saving 80-90% on some items. In fact, moments after purchasing my Shoppers Drug Mart gift cards, I redeemed $50 in a transaction that earned me back another $10 Shoppers Drug Mart gift card (that promotion also runs until November 15, 2013). Combining all of these layers of savings is how we really can Extreme Coupon at Shoppers Drug Mart here in Canada. Not a regular Shoppers Drug Mart customer? It’s still worth stopping in to buy your 3x$150 gift card transactions. Choose from the dozens of different gift cards in the Gift Card Mall and save on gas, groceries, entertaining, and home renovations. Then simply visit Shoppers Drug Mart again anytime after November 22, 2013 to redeem your 24,000 points that you earned from this promotion for $30 in FREE stuff. It really is that simple. The LCBO deal? Well it might not be extreme savings but 13% OFF is a budget hack that I’m willing to raise my glass to. Cheers! * I have not been commissioned or compensated by Shoppers Drug Mart or the LCBO to write this blog post. Who do I need to speak to about that?! Posted on November 12, 2013, in Budget Hacks, Christa Clips, Couponing and tagged Christa Clips, Couponing in Canada, Extreme Couponing at Shoppers Drug Mart, LCBO coupons, Saving on Holiday Entertaining. Bookmark the permalink. 5 Comments. LUV this option..I’m in..Great savings and a great idea…Cheers to cheeper booze! Thanks for popping by, Dee! Looking forward to seeing your holiday cocktail tips this year! I wish I read this post when it was posted. It’s late for me to take advantage of these savings now. However it’s something to keep in mind for next year. Also I saw my favourite wine on sale few months ago. I was shocked as I didn’t think that LCBO has sales. I have to find out where they advertise these sales, or if there is a subscription email list that I need to get my name on. I will let you know what I find out. oh, please do, Maya! I wonder if there’s an app for that!